Dr. Lo and his staff treat women from Tristate region including Pennsylvania, New Jersey, Delaware and New York. If you are within 2-3 hours driving distance, most women will have their surgery safely and be able to go home the same day. Dr. Lo and his staff also sees women for consultations and postoperative visits at his Marlton, New Jersey office. For women that live more than 3 hours from our Philadelphia location, we recommend that you stay overnight at any of the wonderful hotels that are nearby. Our staff will make recommendations for the best accommodations to suit you. As well, we can arrange transportation as necessary and also nursing care for women who need help for the first night after surgery. For women that come from distance, we advise you come 1 day before the surgery date for a consultation, and you have surgery the next day, and then you may fly back in 4-5 days. All follow up may be done by email and phone. Usually you will have had a “virtual consultation” with Dr. Lo so that you have a clear idea of your proposed surgery before your formal consultation with Dr Lo. in his office. Traveling a greater distance to take advantage of Dr. Lo’s expertise? We’re now accommodating Skype Consultations for those interested in meeting Dr. Lo from afar! Practicing in the Greater Philadelphia, Pennsylvania, New Jersey, and Delaware areas since 1991. Dr. Lo will help you achieve your dream goals. 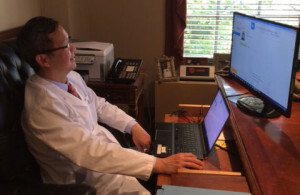 Board Certified Plastic Surgeon, Adrian Lo, M.D, has provided this cosmetic surgery website for informational purposes only. It is not intended as final medical advice. The phrase "scarless breast implant technique" refers to a procedure whereby breast augmentation surgery is performed without leaving any surgical scars on your breast. The surgery is performed via a small incision in your armpit. The surgery will leave a scar in your armpit, but there will be no surgical scars on your breast.